The revival of the Haridasa movement act as a spark of inspiration to many Madhwas of Lingasugur-Manvi-Raichur, all of whom go to Mantralaya and take their inspiration from the Brindavana of Rayaru. Very soon, Raichur district becomes home to hundreds of Haridasas and they write a huge volume of work, which is mind boggling. The Sri Harikathamrutasara of Jagannatha Dasa acts as a catalyst for further development of the Dasa Sahitya. Scores of commentaries, critical treatises and compositions have been written on this work and many Haridasas such as Pranesha Dasa have written about it. Indeed, Jagannatha Dasas himself has composed a poem on Sri Harikathamrutasara. Hence, we start this serial with Jagannatah Dasa. He was a devotee of Raghavendra Swamy and a friend of Dewan Purnaiah. Before his initiation into the Haridasa fold, he was known as Srinivasacharya and he had an excellent grasp of Kannada and Sanskrit. He is the author of Sri Harikathamsrutasara, one of the most important works in Vaishnava literature. He was 90 years of age when he began writing it. He is believed to be Sahlada, the brother of Prahlada. He is known as Jagannatha Dasa of Manvi and his ankita is Jagannatha Vittala. He was a close friend and associate of Jagannatha Dasa. He is today remembered for his composition, “Hadinalku lokha datha, ” where he has sung the glory of Hari as the bestower of every thing to the fourteen worlds. He wrote under the Ankita Venkata Vittala. He obtained Dasa deeksha from Vijaya Dasa. He was a village accountant and he was initiated into the dasa fold as “Pranesa Vittala” by Jagannatha Dasa. He is famous for his song on Rayaru called “Baro Guru Raghavendra, Baraiah Baa Baa”. Another famous composition that is sung regularly is “Guru Madhwa Rayarige Namo..Namo”. He was also called Kuntoji Narasimha Dasa. He was a native of Adoni in Kurnool district of Andhra Pradesh. He was Dewan of the Nawab of Adoni after Venkanna demitted office. He was initiated into the Haridasas fold by Vijaya Dasa as Venugopala Vitthala. He was also called as Timmanna Dasa. It is believed that he was the reincarnation of Belur Vaikunta dasa. Hence, he was also called Pangama Dasa-a reference to his Srivaishnava bearings when he lived in Belur as Vaikunta Dasa. He was the adopted son of Vijaya Dasa. His father was Bhimappa Nayak and mother Yagyamma. He wrote under the ankita Mohana Vittalaru. “Yenu madairadenu gyaanavillade moksha illa in Bhairavi raga”, “Yeedu yaenu vesha vedavyaasaa in Darbaar” and “enkataadrinilayana ankajabhana thoravva alkumi in Madyamaavahati” are some of his popular compositions. Some of his sulaadis are: “Haribhaktarige paapaphala baaradu” and “Indriyagala durvyaaparava bidisi haripadabhaktiyalli rathi kodu”. His last song was Sri Madwva chitta mandirane ninnaye charana taamarasa nere nambhi de…. Naan madida apardagala yenisi bariyadeke yi bhoomandala saaladu. His other compositions include Jayagalu Aangali, Paramahasrushavayithu, Torrava Lakumio and Venkatadri Nilayana. He was known as Surapurada Ananda Dasa. He was born at Cheekalaparavi. His most famous composition is “Sharanara Surapooja”. He was born as Ananda Dasa. He has written several compisitions uiner the ankita Kamalesha Vittala. His perceptor was Keshava Vittala Dasa. He is the author of the hugely popular “Karedare Barabarade” and “Yeeke brindavanadhi”. Some of his famous disciples include Gundacharya, Guru Bheemesha Vittala, Madaka Shira Bheema Dasa, Kamalapathi Vittala Dasa. He was one of the three great devotees of Rayaru, the other two being Appanacharya and Krishna Avadootaru. He has composed several hymns and compositions on Rayaru. It is beleved that he was a dhoota of Prahalada along with Krishna Avadootaru. Ibharampur is just a few kilometers from Mantralaya on the Adoni road. He is the son of Pranesha Dasa. He was one of the many disciples of Jagannatha Dasa. He studied under Jagannatha Dasa and he wrote under the ankita Guru Pranesha Vittala. He was born as Dasappa and he earned fame as a scholar of Karjagi. He obtained the ankita “Shreeda Vittala” from Jagannatha Dasa. His kritis are simple and beautiful. He was grandson of Pranesha Vittala Dasa. His earlier name was Ramadasa and he was born by the blessings of Jagannatha Dasa. He obtained dasa deeksha from his grand father and he has composed krithis bearing the ankitha Shrisha Pranesha Vittala. He is today well-known for his krithi on Srinivasa Kalyana and it nears the ankitha Yer Venkata. He is better known as Yeri Shesha Dasa. He composed this kruti at Tirupati just as he was about to enter the Sanctum sanatorium of the SrinivasaTemple. The compositions is unique as it has Sanskrit shlokas and Kannada padas. Sesha Dasa was a native of Chintamani. Bheemavva, as a toddler, would go to sleep only when her grandfather sang Dasarapadagalu.Otherwise she would cry and refuse to sleep. Narada, came to her in disguise of a Brahmin, and conferred the ankita Bhimesh Krishna on her. She was not only an eaxcellent composer, but she also qwrote devaranamas, vogatu and garathi hadagalu. Her compositions on Hanuman are many and they are an outstanding piece of literature. She has also composed congs on Hari, Sri Mahalakshmi, Sri Krishna and Vishnu. She was a devotee of Rayaru. His original name was Raghavendra Dasa. His ankita is Muddu Mohana Vittala. His guru was Vara Vittala Dasa. He hailed from Doddaballapur. “Vittala Enniro” is his most famous composition. His original name was Ramachandra Rao. He wrote under the ankita Sri Vara Vittala. He was born in Dharwad. His preceptor was Nidhi Vittalaru (Annayacharya). He had a special anugraha of Vijaya Dasa and his ankita Guru Vijaya Vittala was given to him in a dream by Vijaya Dasa. He is believed to be an amsha of Arjuna. He was born as Seshappa in Darur now in Andhra Pradesh. He was working as a Kulkarni in the office of the Quen of Gadhwal, Andhra Pradesh. He has composed under the Ankita Sri Guru Vijaya Vittala. His most famous song is “Nambide Ninna Pada”….on Pranadevaru. She was a master of several languages and she was proficient in Telugu, Sanskrit, Tamil and Kannada. She has wrotten kritis about Ranganatha of Srirangam, Srinivasa of Tirumala and Cheluva Narayana and Yoga Nasasimha of Melkote. She has beautifully described the various festivals of the Srirangam temple. She has given the gist of the Ramayana in 100 stanzas of two lines each. This is the Ramayana mangala. This is the third part of the post on Haridasas. After the fall of Vijayanagar in 1565 to the marauding Deccan states, Hampi is virtually destroyed and the Haridasas flee to different Hindu principalities. The Dasa Sahitya suffers a serious setback and it is only with the advent of Vijaya Dasa that the revival of this bhakti movement occurs. Raghavendra Swamy encourages the Haridasa movement and first Vijaya Dasa and then Prasanna Venkata Dasa take inspiration from him. Then follows a long and illustrious list of Haridasas who acknowledge Rayaru as their master and go on to shower him with love and affection. Here goes the list of Haridasas who owe much of their literary output to the bard of Mantralaya. She was twelve years of age when she was married off to a 95-year-old man. Her married life lasted for eight days as she became a widow on the ninth. Today, we are fortunate in having with us 260 of her songs. Her composition, “Beegara Haadu” she writes about the bantering that follows a wedding, while “Sringara Tara Tamya,” is a description of various ornaments. She says here that of allthe ornaments, the only two worth possessing are bhakti and gnana. The “Muyyada Haadu,” speaks of the exchange of gifts during Gowri pooje. He was earlier known as Venkanna and he was the second son of Narasappiah and Laskhmi of Bagalkot and was born in 1680. Venkanna’s elder brother was Raghavendra. Narasappaiah belonged to the famous Kakhandiki family in Kakhandiki near Bijapur. He was given a tamburi by Lord Srinivasa himself in Tirumala. Some of his compositions are “Satyabhaama Vilasa” or “Srikrishna Paarijata” which has 51 stanzas: “Narayana Panjara”, which has 40 stanzas and Samasta Naama Manigana Shatcharana Padyamala which comprises 70 stanzas. The Narada Koravanji is a beautiful composition where we see Narada as a Koravanji. He comes to narrate Rukmini’s birth, her marriage to Krishna and other events. His other works include Bhagavatha – Krishna Charitre and the Uttaradi Matha Guruparampara Kruti. By the way, his Bideno Ninnanghri Srnivasa kruti is sung even today during the religious function of Mettilotsava and Dasa Sahitya events. His other compositions are: Sri Venkateshwara Ninna, Besarade Sadashiva, Nandenado Swamy, Nadedubaama Lakshmi, Tappu.. Pariharisuva. He was born as Narasimha Dasa. He wrote under the anikta Narasimha Vittala. Purandara Dasa came in his dream and initiated him as a Haridasa. He set in motion the second revival of the Dass Sahitya. He was a great devotee of Raghavendra swamy or Rayaru of Mantralaya and he is the first to reveal the avatars of Rayaru and the gods who sit alongside him in the Brindavana at Mantralaya. Vijaya Dasa has composed 25,000 songs. He was initiated into the Haridasa fold by Purandara Dasa himself who came in his dream and took him to Vyasa Kashi. Veda Vyasa or Narayana beckoned Vijaya Dasa and wrote the akshara Vijaya on his tongue. Form then on, Vijaya Dasa went on to write innumerable songs in praise of Hari. His “Kailaasavasa Gowrisha Easha” is highly popular. He was earlier known as Subbannacharya of Kallur, Raichur district. He was a scholar in Grammer and Logic. Being puffed up with the pride of learning, he ridiculed Vijaya Dasa. He repented later on and became a devotee of Vittala. He came to be known as Vyasavittala. His Ankita was Vyasa Vittala. He composed Vijaya Kavacha, a song in memory of his guru, Vijaya Dasa. Gopala Dasa’s spiritual guru was Vijaya Dasa. It was Gopala Das who sent Jaganntha Dasa of Manvi to Pandrapur so that he could obtain his ankita as Jagannatha Vittala which was inscribed on a stone on the banks of the Bheema. Gopala Dasa gave away forty years of his life to Jagannatha Dasa and also saved the life of his adopted son and disciple, Mohana Dasa. It is believed that he was an incarnation of Ganapathi. He became spiritually enlightened after repeating Gayatri mantra. An astrologer, he was able to foretell three previous lives of any person who came to him. He wrote under the ankita Gopala Vittala Dasa. Some of his compositons include “Chandra Gunasandra”, “Guru Raghavendrara Charana”, “Rathavanerida Raghavendra”, “Sharanu Sharanu Raghavendra”. He was one of the three brothers of Gopala Dasa. His name, before he was given Deekshe, was Seenappa. Gopala Dasa initiated him into the Haridasa Samprasaya and gave him the ankita by name he was the brother of Sri Gopala Dasa. He has composed under the name or ankita Varada Gopala Vittala. He has several pada padyas and suladis to his credit. He was another brother of Gopala Dasa. He as known as Dasappa and he studied shastra under Vyasathathvajna. He too took Haridasa deeksha from his Gopala Dasa and composed many krithis bearing the ankita Sri Guru Gopala Vittala. He was the youngest brother of Gopala Dasa. His name was Rangappa and Gopala Dasa gave him the ankita Thande Gopala Vittala. Helevanakatte Giriamma is known for her exquisitely lyrical compositions Chandrahasa and Kaliya Mardhana. She was born in Ranibennur and was married to Tipparasa by her father Bistappa. She was a great devotee of Hari and always meditated on Ranganatha in the temple at Helavana Katte, a small village. She spent a lot of her time at the Ranga Mantapa, where she not only composed songs but also drew Rangavalli or Rangoli paintings, conjuring up images of Krishna and his sport among the Gopis. Giriamma built temples and consecrated many idols for the worship of Hanumantha (She called Hanuman as Maruti) and Ranganatha. She is unique among women who took to the vow of celibacy and lived a dedicated life devoted to Hari. Her compositions include “bhaktala binnapaha” and “intavanigihyaange”. He was earlier known as Venkataramacharya. Later, he came to be known as Paramahamsa Vyasattvagna. He was a great devotee of Raghavendra Swamy of Mantryalaya. He is said to have performed many miracles. He was proficient both in Sanskrit and Kannada. He wrote 13 works in Sanskrit, of which his treatises on Manasasmriti and Upasanabhaga and his comments on the seventh canto of Bhagavata are well known. In Kannada, he wrote ten ugabhogas, sixteen suladis and hundreds of padas. This is the second part of the post on Haridasas. The second innings of the Dasa Sahitya actually starts from Sripadaraja. When he was in Srirangam, he saw Tamil being used for offering prayers and Tamil compositions sung when people prayed at the RanganathaSwamyTemple. When Sripadaraja came back to Mulabagal, he wanted to perform pooje in Kannada, compose in Kannada and even give discourses in Kannada. He did all of this and more and hence, he is universally acknowledges as the Bheeshma Pitamah of Dasa Sahitya. He also gave a fresh fillip to writing devaranams in Kannada. Therefore, the second renaissance starts with him and this was continued further by his most beloved disciple, Vyasa Raja. He made Mulabagal his home and, therefore, came to be called as the Bard of Mulabagal. He is known as the Bheeshma Pitamaha of Carnatic music and also of Haridasa sahitya. He is a pioneer in writing suladis in Kannada and he has written the only Dandaja in Kannada sahitya. “Ne ittahange iruveno hariye…”, “Kangalidyathako kaveri rangana nodada…” and Bhushanake Bhushana. Sripadaraja initially started composing under the Ankita of Gopinatha. Later, his ankita was rangavittala. He has composed many Kritis in both Carnatic and Hindustani Raagas. One such rare Kriti is: “Nana nanadana paahi”, which can be sung in nine different Raagas. His other compositions include Gopi Geethe, Bramara Geethe, Lakshmi Narisimha pradurbhava Dandaka and other compositions. He is also the author of the Kannada work, Madhwa Nama, which is an exquisite piece of poetry. His Brindavana is in Nasasimha Theertha near Mulabagal on the Bangalore Tirupati road. He deserves special mention as the seer who founded both the Dasa Koota and the Vyasa Koota. He gave deekshe to Purandara Dasa and several others. A disciple of Sripadaraja, he was a rekowned scholar in Sanskrit and Kannada. He wasthe Rajguru of six Emperors of the Vijayanagar Dynasty, including Krishan Deva Raya. His most famous composition, which even today is a evergreen song, is Krishna Nee Begana Baro. His other compositons are: “Namo Parvathipati”, which is highly autobiographical and hints at the tussle between Sanyasa and Grihasta. The other compositions are Avava Bageyinda: Bharatipatiya Pada: Eduraro Guruve Samararo: Ellimaya Yaadane: Yenna Bimbamuruthiva: Govinda Govinda Krishna: Jarathvavanu Maadida: Jayavayu Hanumantha: Kava Divayu: Krishna Krishna Krishna: Labavahudu Harikathamura: Mahiume Salade Iste: Pavamana Sanjatha Maruti and Tore Begane Toraja Nayane. 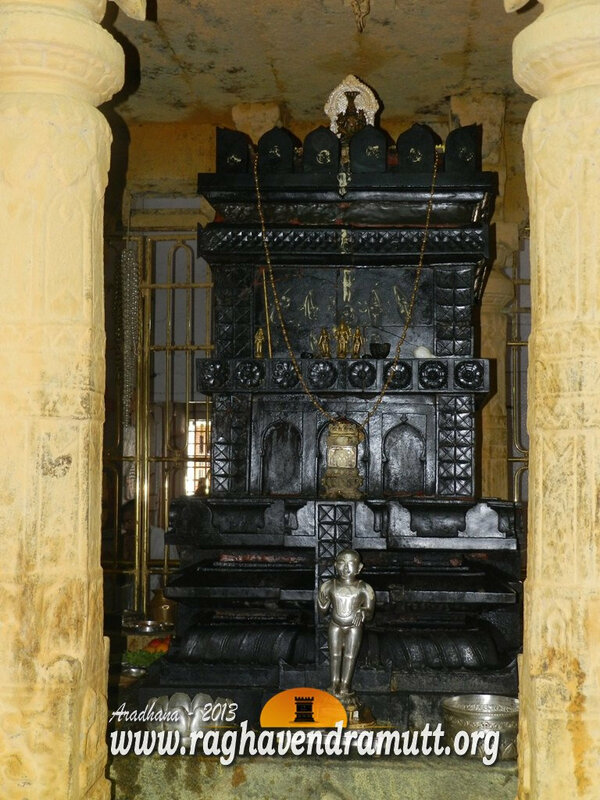 The brindavana of Vyasa Raja is in Nava Brindavana, Hampi. He was the pontiff of the Sode or Vadiraja Matha. He lived for 120 years. He was a disciple if Vyasa Raja. He was a contemporary of Purandara Dasa, Kanaka Dasa, Belur Vaikunta Dasa, Srinivasa Theertha, Rama Theertha, Vijendra Theertha, Sudhindra Theertha and many others. He is an outatsnding Sanskrit scholar and his Rukminisa Vijaya is a masterpiece. He was a devotee of Hayagreeva and he has composed many songs on him. Vadiraja Theertha has composed songs in Sanskrit and Kannada. . Some of compositions are Narayana Enniro, Govinda Gopala Gopika Vallabha and Vani Paramakalyani. In Enu sukritava maadidalu Yashodhe, he describes the good fortune of Yashodha, as she is able to call Krishna as her son. Vadiraja reformed the Paryaya system of the Sri Krishna matha of Udupi. He revealed his identity as Bhavi Sameera only after he entered Brindavana in Sode. He dictated his autobiography from the Brindavan to a person who was dumb and deaf. This work is called Vrndavanakhyanam. His Brindavana is in Sode or Sonde near Sirsi. Born as Srinivasa Nayaka, he was a disciple of Vyasa Raj aand obtained Deekshe from him. As Srinivasa Nayaka, he was called “Navakoti Narayana”. He renounced wealth and took to a life of a dasa. He was an amsha of Narada muni. He is belived to have written 4,75,000 compositons of which only 800 survive. He is called the pioneer of Carnatic music and the man who set into motition the Haridasa Sahitya. He selected 32 raagas (Batthisi) in which Carnatic compositions were to be created and this has been followed for centuries. He was an ardent devotee of Vittala of Pandrapur. He died at the Purandara mantapa in Hampi. Almost all the songs of Purandara Dasa are popular and many of them are sung everyday such as Baro Krishnaiah, Jagadhorana, Bhagyada Lakshmi Baaramma, Adisidalu Yashode, Taarakka Bindege, Yaare Rangaba, Yaadava Nee Baa, tamboori meetidaava, amma nimmaManeyalli, aaparadhi nanalla, bandidella barali, deva bandana, hari Smarane maado, Oodi baaraiah, Donkubalada Nayakare, Ragi thandeera, Gajavadane Beduve, rama mantraya and many others. Like Purandara Dasa, he too was a rich man but a miser. He lived in Belur, Hassan. One day, he was presented a Hayagriva Saligrama and told that by performing pooja, his wealth would increase manifold. When he began performing regular pooje, he became devoted to Lord Hayagriva and he lost interest in the materialistic world. Vadiraja Theertha then blessed him and named him Vaikunta Dasa. He rarely, if ever, stirred out of Belur. He was a close friend and companion of Purandara Dasa and a disciple of Vadiraja Theertha. His devotion to Hari was such that Krishna danced in front of him when he sang. All the three dasas, Vadiraja, Kanaka and Purandara have paid trubuted to Vaikunta Dasa. He was a shishya of Vyasa Theertha or Vyasa Raja and a contemporary of Purandara Dasa and Belur Vaikunta Dasa. He was a devotee of Adi Keshava. He was a prolific composer and hemade Kaginale is home. He has hundreds of suladis to his name. He is next only to Purandara Dasa in the Dasa sampradaya. Kanakadasa has many popular songs such as Bhajasi Badukelo Manuja, Nee maya olago ninnolu, Bagiluna teredu Seveyanu. His other works include Nalacharitre, Haribhaktisara, Nrisimhastava and Ramadhanyacharitre, a rare work on class struggle. He wrote two hundred and forty Kirtanes, Ugabhogas, padas and mundiges or philosophical songs. “Ellaru Maduvudu Hottegagi”, is a famous composition. Giriraja, before being initiated into the Haridasa fold by his father-Purandara Dasa-himself. He has written several compositions but many of them appears to have been lost. In one of his compositions, which start with the line, “In the elephant”, he has given a beautiful account of the nature of the soul, Sri Hari’s moola roopa or form and several other spiritual aspects. He too was a son of Purandara Dasa. He collected the works of his father and left Vijayanagar after the defeat and death of the Vijayanagar Emperor, Rama Raya, in the battle of Talikota near Bijapur in 1565. Madhwapathi has composed a song in 1564 which gives us the exact day and time when Purandara Dasa died. Vyasa Raja has referred to Madhwapathi Dasa when he gifted some villages to him. There is a stone inscription to this effect in a temple near Hampi or Vijayaagar. Madhwapati was reborn as Vijaya Dasa. “Krishna Krupe maado”, is one of his most famous songs and it is in his ankita Madhwapati Vittala Dasa. Mahipati Dasa hailed from Kakandaki in Bijapur district. He was born in 1611 to Koneri Raya or Koneri Rao. His guru was Kolhar (Kolhar is a small town on the banks of the Krishna near Bijapur) Prahalad Krishnacharya. Mahipati worked as an accountant in the office of the Nawab of Hyderabad for some time. He knew several languages including Kannada, Sanksirt, Marathi, Urdu, Hindi and Persian. His most famous composition is titled “Kolu”. He was the son of Mahipati Dasaru. He took to a life oflitarature and learning, while his brother, Devaraya, took to arms. While Devaraya became a well-known warrior, he later headed a small principality. Guru Mahipati Dasa was earlier known as Krishnaraya. He took Dasa Deeksha from his father and carried on the tradition of his illustrious father. Gopala Dasa (1722-1762) has several beautiful compositions on Raghavendra Swamy. In one of his well-known suladis, he calls Raghavendra as a person who can easily overcome the evils in the Kali Yuga. Here, the Dasa wants us to know that if we are to fight in Kali Yuga against the forces of evil and emerge victorious, the seer of Manthralaya is our only hope and our only succour. He says Rayaru with his skahti and divineness will help us overcome all trials and tribulations of a human being. In this famous Suladi, he speaks of Rayaru as he saw him in the Brindavana. He says these are the Gods he saw with his own eyes when he visited Mantralaya and prayed before the Brindavana of Rayaru. Gopala Das is thus the second Dasa after Vijaya Dasa to see Rayaru along with other gods in the Brindavana and describe the divine scene to us. In this composition, Gopala dasa lovingly describes Rayaru and this song has become an almost daily routine in the Rayara mathas where it is sung. Unfortunately, this song is wrongly attributed to Jagannatha Dasa. Similarly, many mistake Guru Jagannatha Das with Jagannatha Dasa. Guru Jagannatha Dasa was from Kosigi, while Jagannatha Dasa of Manvi wrote the Sri Harikatamrutasara. Both these dasas lived a century apart.